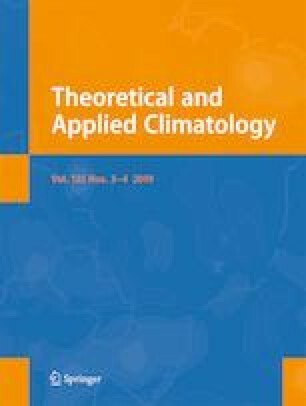 In this paper, a stochastic model, previously proposed for the maximum daily temperature, has been improved for the combined analysis of mean daily temperature and diurnal temperature range. In particular, the procedure applied to each variable sequentially performs the deseasonalization, by means of truncated Fourier series expansions, and the normalization of the temperature data, with the use of proper transformation functions. Then, a joint stochastic analysis of both the climatic variables has been performed by means of a FARIMA model, taking into account the stochastic dependency between the variables, namely introducing a cross-correlation between the standardized noises. The model has been applied to five daily temperature series of southern Italy. After the application of a Monte Carlo simulation procedure, the return periods of the joint behavior of the mean daily temperature and the diurnal temperature range have been evaluated. Moreover, the annual maxima of the temperature excursions in consecutive days have been analyzed for the synthetic series. The results obtained showed different behaviors probably linked to the distance from the sea and to the latitude of the station.